West Africa’s Ebola epidemic is now the deadliest on record, according to the World Health Organization. The disease has a mortality rate of up to 90 percent. Since the outbreak began in February, there have been 635 known infections and 399 deaths in Guinea, Liberia and Sierra Leone. Ebola made its first recorded appearance in Central Africa in 1976, but that year’s death toll only reached 280. On Friday, the WHO warned the nations neighboring those hit by the epidemic — including Mali, Ivory Coast, Senegal and Guinea Bissau — that the disease could pass into their borders through infected travelers. A report by The Washington Post said a lack of education on Ebola could be behind the outbreak’s magnitude. The report said many West African communities distrust doctors, which has resulted in poor precautionary health measures. For example, people continue to hold and attend funeral ceremonies for those who are killed by the disease. This can prove deadly, as exposure to infected bodies allows Ebola to spread easily. Ebola is contracted when people come into contact with the infected tissues, blood, or body fluids of humans or other animals like monkeys. The disease causes fever headache, muscle pain and conjunctivitis at first. If the infection doesn’t die off, it progresses into severe and deadly phases of vomiting, diarrhea and internal and external hemorrhaging. On Monday, Doctors Without Borders (MSF) released a statement that said the epidemic can only be brought under control if regional governments and aid agencies provide them with a “massive deployment” of resources. 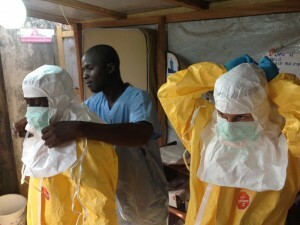 In early July health ministers from eleven countries will be meeting in Accra, Ghana, to plan a regional response to the outbreak.